Body made of steel sheet finished with powder coating RAL 9003. 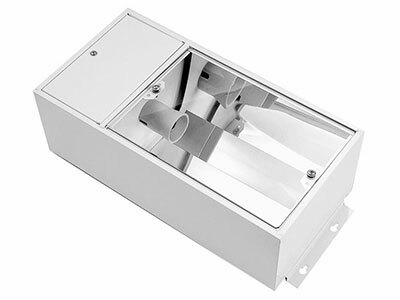 Aluminium anodized polished reflector forms optics of luminaire. Optic part of luminaire is covered with hardened heat resistant glass 5 mm thickness with silicon rubber sealing gasket. Electrical components are assembled on separate gear tray fitted with screws inside of luminaire. Luminaire is possible to prepare as ceiling mounted or recessed with transitional frame and fixing holders.